I have fibromyalgia. It does not have me. May 12th each year has been designated as Fibromyalgia Awareness Day. 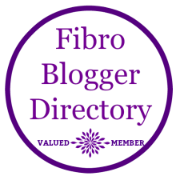 For most of us suffering with Fibromyalgia Syndrome every day is really awareness day, as explaining this condition to others is part of the game. It is a “silent condition” that it is ill-understood. We don’t always look sick, but we may be exhausted, in pain, and suffering silently from one of the hundreds of symptoms associated with this. Fibrowarriors many of us call ourselves, as we just keep on keeping on. People may have heard the term from a drug commercial on TV or from the news of Lady Gaga cancelling part of her tour, but do they really understand it?